Culbin has been described by antiquarians and archaeologists as ‘one of the richest archaeological fields in Scotland (Callander 1916).’ Over 29 500 finds from Culbin are held at the National Museum of Scotland and many more in local museums such as Nairn, Elgin, Forres and Inverness. A variety of different types of jewellery from a range of periods has been found at Culbin over the years. 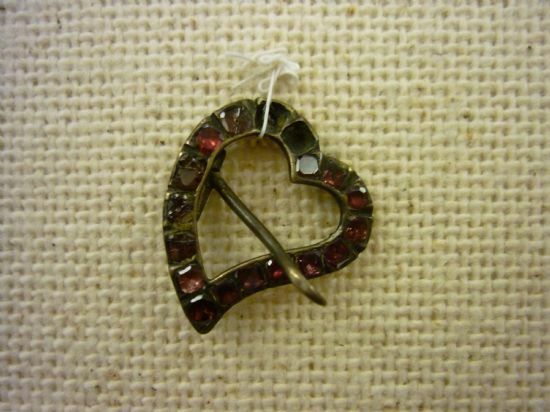 One of the most interesting types is a heart shaped brooch, also commonly known as a Luckenbooth Brooch. These brooches have been around since the 15th-16th centuries and are one of the most common types of traditional Scottish brooches. 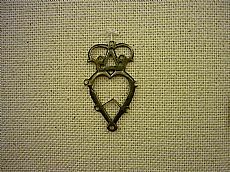 They were often given as love tokens between couples and fastened to a babies shawl or attached to children’s clothing to protect them from harm. They were reputed to have had protective properties, averting the ‘evil-eye’ and keeping witches away from vulnerable children or mothers. Most Luckenbooths were traditionally made in silver, a popular and affordable material. However the materials and quality of manufacture varied depending on how wealthy the wearer was. 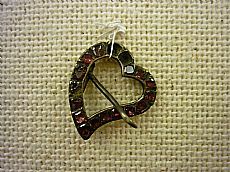 Some brooches were made of cheaper imitation metals with glass ‘gems’ inset, while others were made of gold and decorated with precious stones. A variety of these brooches have been found at Culbin, ranging in size and quality. Lukkin-buthis, Lucken-booth(e)s, n. pl. Also: Lukkyn-, Lwkyn-, Luken-, Luckin-, lwikin- and -bothys, -buithis, -es, and Locking-buiths. The Luckenbooths or "Locked booths" which housed Edinburgh's first permanent shops were built around 1460. Originally exclusively used by goldmiths and jewellers, they later housed tenants with a variety of trades including a baker, milliner, hairdresser and "ane chymist and druggist". These booths were one of the places that the brooches were first made and sold, but the tradition spread across Scotland and beyond. 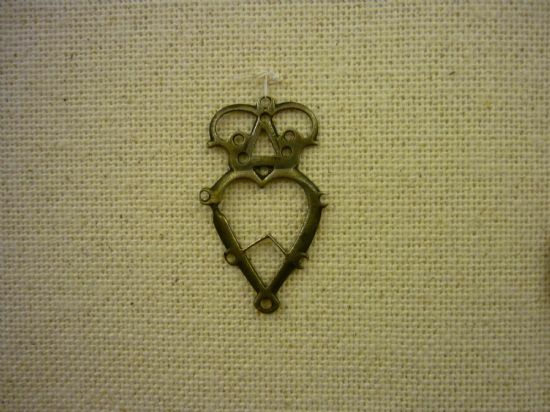 Charles Jamieson, who worked in the town of Inverness from 1797 – 1819 was a prolific maker of silverware, including many heart brooches, it is likely that many of the brooches found at Culbin are the products of Jamieson and other local manufacturers. As a result of Scottish fur traders in North America trading with Native Americans these brooches also became popular abroad in the 18th century. Some brooches have been found during archaeological investigations on Native American sites such as Kaukauna, Wisconsin. To see the brooches and other finds from Culbin Sands visit Nairn Museum. The temporary exhibit ‘Culbin Sands: Prehistory to Present’ presents the archaeological evidence for activity at this site over the past eight thousand years including a selection of Luckenbooth Brooches from Nairn and Elgin Museums. More information on the Luckenbooth abroad see Proceedings of the Antiquaries of Scotland Volume 34 Page 220-224.